Hexaflexagons are paper hexagons folded from strips of equilateral triangles, that show a number of different faces when folded. See my links area for more detailed discussion of their basic characteristics. Here is a scanned copy of a "catalog" that I once compiled (~1973) of all possible hexaflexagons up to order 10. 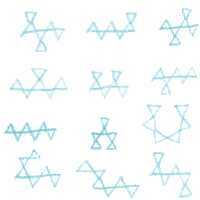 The pictures show the forms of the strips and the several Tuckerman traverses (TT) that can be obtained from each strip, as diagrams of interconnected triangles that describe how the faces appear in the hexaflexagon. The numbers adjacent to most of the TTs indicate the folding sequence in the strip that produce them. The strip is to be folded at the triangle joints indicated by the numbers, starting from the arrow, or from the left, always in the same direction, with the sequence repeated 3 times at equally spaced points of the strip. When there is more than one line, the initial folding results in a straight strip, that is to be folded as the strip of the hexaflexagons of order 6 or 9, starting from the listed joints. Once obtained a strip with 9 triangles and a tab, it is folded as the trihexaflexagon. Note that the number of possible hexaflexagons of order N is precisely the number of possible TTs, or the number of ways where N-2 triangles can be connected by their corners, with only two triangles per connection and without forming loops. I wrote a program named HexaFind (rewriting an Algol program that I wrote by 1977) that finds all the possible TTs for given orders of hexaflexagons. In the present version it can also show the face numbers corresponding to the nodes, and, using the "reflectocloning" method developed by David King, show the strips that when folded result in hexaflexagons with those state diagrams. Example: The Tuckerman traverse of the last hexaflexagon of order 12, and the strip that produces it (to be replicated 3 times). The upper numbers correspond to the frontal face, and the ones below to the back face.